Aroma of malted wheat and malted barley. Medium lasting head with good lacing. Medium bodied flavor and mouth feel. Another amber ale to sample. Seems everyone has one these days. 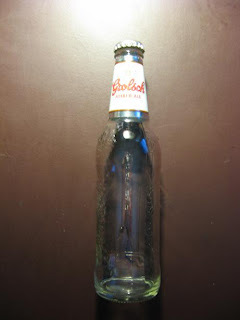 Grolsch makes theirs with malted wheat according to the side label. I have had their beer and enjoyed it, perhaps more for it's relative affordability than for taste. So back to the amber ale...it is average compared to other amber ales on the market, but refreshing none the less. Good ale at a decent price.